Today we started off the seventh day of chesed by going to the Emunah Day Care Center in Mevaseret Zion. The purpose of this center is to help absorb the Ethiopian children into Israeli society. We played with the children and blew bubbles with them. The children were so cute. I love that I didn't even need to go to one of the toddlers first, but rather this gorgeous girl came up to me with a smile, making me return the beautiful gesture. Playing, blowing bubbles, and laughing was just really nice. It was the perfect way to start off a day of happiness, blessings, and more appreciation. After that we headed to Keren Or, a facility for special children who are physically disabled, mentally challenged, and also visually impaired. We had the opportunity to interact and dance with the children. This experience spoke out to me when I was leaving and went over to tell one of the individuals goodbye. He felt my hands and then gave me a hug. It was during those seconds of unconditional love that made me appreciate what I have. It's a feeling that feels so special inside my soul, where someone with disabilities just becomes a person with a heart so pure, and inspiring. We then went to package boxes of food for the needy. Packing hundreds of boxes was exhausting, but also fulfilling after seeing how many boxes we packaged. We packed dry goods, produce, dairy items, and even laundry supplies. Following lunch we went to Tel Hashomer hospital to give out toys to sick children. It was a truly incredible experience. At first we gave children presents, and then went into a unit for teens who are undergoing treatment for eating disorders. I really enjoyed it and learned that what we do could have a tremendous impact. Specifically, there was one 18 year old girl whom I was talking to, and I asked if anyone explained why we're here- she said no. And so I explained to her in Rabbi Besser's words- that we're a group which came from America to Israel, during vacation, not with our families, to visit places. I expanded by talking about how we also want to come make people happy and wish everyone a refuah shelemah because we care. She looked at me in such awe, got up, and gave me a hug. It was seriously something else. I can't get over how happy it made her, what a smile she gave me, and how genuinely thankful she was. It was really an above and beyond experience. 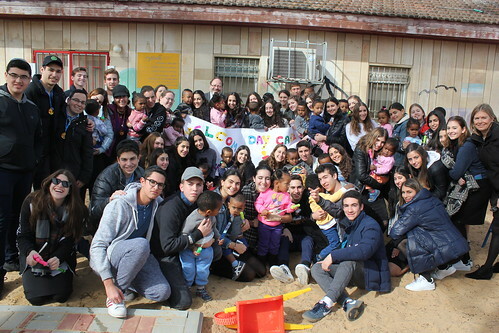 Our last stop was Emunah's Bet Elazraki Children's Home. This is a home for children who had to be removed from their homes for various reasons. We witnessed a performance by the choir and dancers of Bet Elazraki. We then enjoyed dinner and a dance party with all the children. Yehuda Kohn, the director of the home, explained how they define having parents as meaning that there is someone who cares for them and that's what this home provides for all the children. It was amazing to hear how children are held by the hand through everything. Yehuda explained that he salutes his "kids" in the army, he walks them down the aisle, and is a grandfather to their children. I found that to be so special and just loved dancing and singing together. We ended the night with a kumzitz on the roof of the Inbal overlooking Jerusalem. Singing "Im Eshkachech Yerushalim" had so much more meaning while looking at the old city walls.